Easy Homemade Chicken Soup, A Delicious Hearty Soup That's Ready In An Hour! 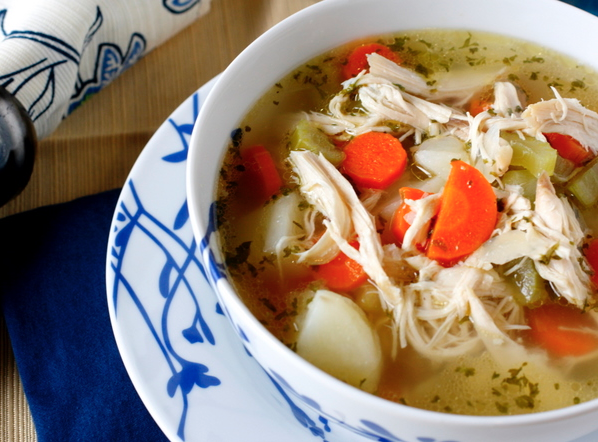 Looking for a delicious and comforting homemade chicken soup to satisfy your soul? This super easy recipe is perfect, especially right after the holidays like Memorial Day, where you just want to relax and enjoy the comfort food classic that has all the signature flavors of a really good bowl of chicken soup. Mm-mm-good! Simple is best. It’s an old-fashioned recipe made easy and tastes as if you spent hours putting it together. You still get tender, moist and juicy chicken pieces and hearty vegetables in a delicious broth that’s ready in an hour! Enjoy with this easy buttermilk biscuit recipe for an amazing meal. If you want the old-fashioned way, including making your own broth? Here’s an excellent and easy-to-make recipe too! No doubt both will guarantee to warm and satisfy your heart, soul, and BELLY! So delicious! Tender, juicy chicken with hearty vegetables in a delicious broth! Very satisfying! You can use either potatoes, rice or noodles in this recipe. Whichever you prefer. For best results if you want noodles in your soup, cook them separately and add them to the soup at the end. Do not cook uncooked noodles in the soup as they tend to eat up the broth, and get mushy when reheated for leftovers. Want Another Great Chicken Recipe? Now Watch How To Make Chicken Caesar Salad Wraps!